Just last week, the friends at Edmunds had the opportunity to test drive the 2009 BMW 3 Series , and they gave the 3er facelift two thumbs up. 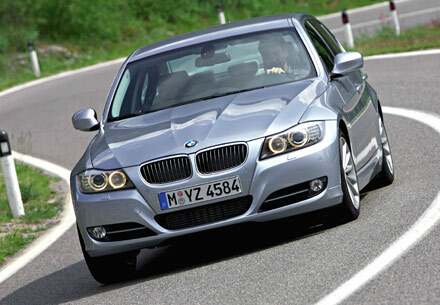 This week, the fellows at Channel4 got their hands on a 330d. Definitely a good review, lots of details and useful information. As class benchmarks go, few are as enduring as the BMW 3-Series. Now in its 33rd year and fifth incarnation, it still remains the default choice for those seeking out the best, most capable compact exec. Make no mistake, it’s not perfect, but its blend of top-drawer handling, fine quality and the best engines in the business mean, even after three years into this current fifth generation, it still has what it takes to top its class against stiff new competition. Now the Munich brand has put its best-selling, but middle-aged, number under the knife to prepare it for the final few years before an all-new sixth generation car arrives. As BMW facelifts go, it’s a big one, involving sheet metal changes with a new twin-ribbed bonnet, front and rear bumpers and, perhaps more predictable new front and rear lamps.